There have been rumours flying around regarding Team Modena’s 2007 plans: Sporting Director Rik Bryan was pleased to explain where the team stands at the moment. But it seems likely that the team will run more than the two DBR9s – and there are other projects bubbling along too. “We have other individuals who want us to run cars – and one of them is a Ferrari 430, possibly in collaboration with another team. That would fit very well because I’ve got connections with Ferrari as a customer, and they’re keen for us to do it. There’s more to Team Modena than preparing and running cars though: as we revealed in late August – here – Team Modena has Sergio Rinland as its Technical Director and Rik Bryan said then that the team has a plan to “demonstrate its capabilities at increasing levels of technology”. He added to that explanation of the team’s ambitions by admitting today that “we’re working on a number of very interesting projects on the design and engineering side. We have two significant projects that I can’t talk about, both with major manufacturers. There is certainly plenty of activity going on behind the scenes in various areas of GT and prototype racing: we’ll bring you the details (from Team Modena and elsewhere) just as soon as they become firmed up. 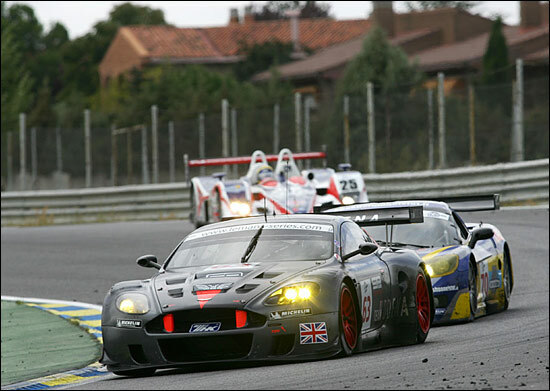 Here's an image from the last Le Mans Series race of 2006, at Jarama.